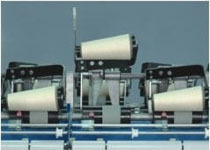 Four-spindle tape drive system is well known for lesser energy consumption, lesser noise generation and lesser maintenance cost. At the same time it ensures the twist variation at the lowest. Our valuable customers in India and abroad are fully satisfied with the quality. Veejay manufactures high quality spindles and spindle components. 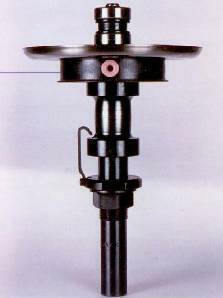 The proven design of Veejay spindles does not warrant any replacement. The specially designed geometry of spindles enables less energy consumption. Veejay TFOs are equipped with hand braking system. 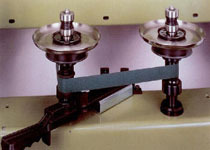 The hand brakes are more efficient and robust in comparison with knee breaks. And this is also safer. 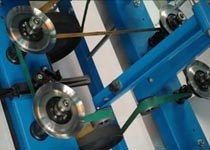 The hand brakes are fatigue free to the workers and also working becomes easier since the workers are mobile. The cradle lifting arrangement disengages the delivery package automatically during end breakage. Ergonomically designed cradles with higher strength, and better supports ensures smooth lifting of cones of heavy weight smoothly with out affecting adjacent spindles. Poly V - Belt Drive in replacement of multi V - belts ensures better grip and effective drive transmission with negligible slippage. Reduces energy consumption due to low torque ratio. 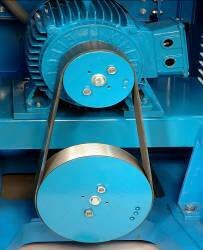 Toothed belt drive system gives accurate drive transmission without slippages. This ensures the ratio between rate of twisting and rate of delivery as constant. 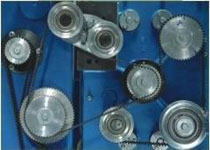 Further the gear trains are designed for zero maintenance and does not consume any lubricants.